Beercandu is a new Celtic punk band from Solo, Indonesia. 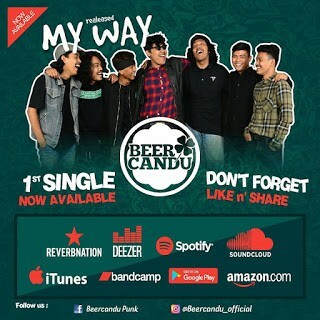 “My Way“, their first single, is on the main digital platforms, an can be downloaded from Reverbnation for free. 2017-11-23 EP REVIEW AND NAME YOUR PRICE DOWNLOAD – BALEYCORN BASTARDS "Hops & Dreams" (2016) 2017-11-02 NAME YOUR PRICE DOWNLOAD – HAWTHORN "RavenWood" (2017) 2017-07-26 NAME YOUR PRICE DOWNLOAD – LÁD CÚIG "Nosaltres sóls" 2017-06-01 EP REVIEW – RAIN IN SUMMER "Discordant Anthem from the Gutter" (2017) 2017-05-15 FREE DOWNLOAD – St. BUSHMILL’S CHOIR "s/t" (2004) 2016-12-06 FREE DOWNLOAD – ROTTEN RIOT 2016-11-06 FREE DOWNLOAD – LORETTA PROBLEM "Welcome to the Circus" 2016 single 2016-10-04 FREE DOWNLOAD – TENHOLES "Mesin Factory"